Discussions Magazine Music Blog: SPAZ reviews Punk singer/songwriter PATRIK FITGERALD's new 2CD collection! SPAZ reviews Punk singer/songwriter PATRIK FITGERALD's new 2CD collection! 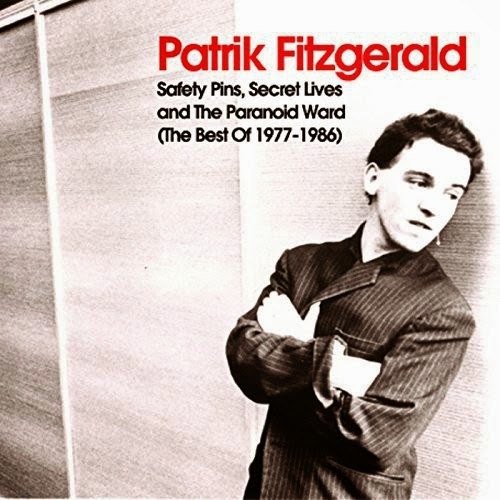 Safety Pins, Secret Lives And The Paranoid Ward (The Best Of 1977-1986) is a handy two CD set that gathers together the best recordings from Patrik’s first nine years on the music scene. Though he may have had the attitude and the sense of humor of his Punk contemporaries, Patrik’s musical approach was unique. Some call him a Punk Poet, but that’s a term that I think should be reserved for the equally intriguing John Cooper Clarke. Maybe a Punk Folkster? Folk Punkster? No matter what category you initially want to file him under, you really need to immerse yourself into his music before lumping him in with anyone. Closer to Billy Bragg in spirit, Patrik’s first recordings were acoustic-based and they recall a strange mix of Pete Shelley’s heartfelt Punk and R. Stevie Moore’s lo-fi oddball genius. Maybe not the finest singer in ’77, he quickly found his voice (no pun intended) and forged a highly unique path that included albums, singles, and Eps. Most of the first disc features Patrik and his acoustic guitar banging out some mighty fine songs - “Life At The Top” is particularly haunting and heartbreaking while “Banging And Shouting” sounds like a blueprint for Billy Bragg’s early work. Disc Two finds Patrik and his guitar joined by other instruments, most notably some experimental keyboard work. In fact, by the end of the disc – particularly on “Putting Wings On Aeroplanes” and “Down Mexico Way”, it’s hard to imagine this being the same artist that did “Safety Pin…” some 40+ songs earlier. Some may find listening to the whole of this anthology at once might be a bit much, but spread it out over a few sittings and you’ll discover an artist that is more than just a Punk with an acoustic guitar. An eye and mind opening experience indeed.